David Wamer, NWTF Georgia save the hunt coordinator, worked with refuge staff and volunteers from eight chapters in Georgia and South Carolina, to create a weekend of wildlife and conservation education, paired with firearm safety and hunting. The National Wild Turkey Federation (NWTF) and the Savannah National Wildlife Refuge recently hosted youth hunters for the first ever Youth Hunt & Learn Weekend – Turkey event. The educational programs for the weekend included Turkey Hunting 101, a course in turkey biology and habitat as well as hunter safety. The attendees, all first time visitors to the refuge, also received a tour of the nearly 30,000-acre refuge that is home to wild turkeys, bald eagles, neo-tropical migratory songbirds, large concentrations of wading birds and migratory ducks and American alligators. In addition to the youth and the volunteers, a representative from the Okefenokee refuge attended the event. 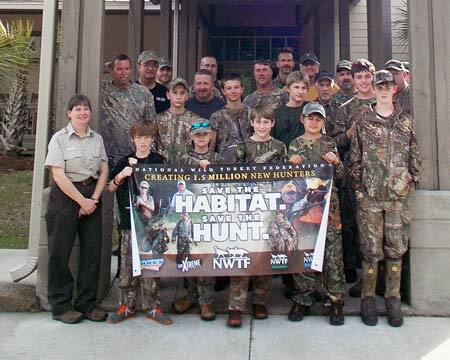 They are considering working with the NWTF to host similar events in their area.